The best restaurants possess a trifecta of attributes: good food, charismatic personalities, and unique ambiance. The ratios of these factors may vary – food may outweigh ambiance or personalities might trump food – but the best of the best balance these perfectly. And, they make it look easy. Tres Carnales is a rare find among restaurants anywhere and not just in Edmonton. Lively illustrations and Mexican artifacts adorn the walls and lend an air of authenticity, rather than kitsch. Owners Daniel, Chris and Edgar infuse their hard-earned brainchild with knowledge, hilarity and a most welcoming, casual ease that makes the first-time diner feel like an old friend. Tres Carnales, which has only been open since early summer 2011, is a taqueria. They create tacos, which are widely known to North Americans (albeit, not necessarily in their authentic state), and tortas, which are Mexican sandwiches. At least eight incarnations grace their menu at any one time, and it behooves every diner to inquire about specials. Case in point: a recent special featured pork simmered in its own fat with beans. This unctuous delicacy graced a quartet of corn tortillas that were gently adorned with a savoury layer of melted cheese. The result? Pure, unadulterated decadence. Regular features, such as Rajas Con Crema (which includes grilled poblano chilies, cilantro and corn in a cream sauce) and Carnitas (braised pork shoulder) can be obtained as a taco or a torta. The atmosphere is electric. The food is explosively creative, delicious and authentic. 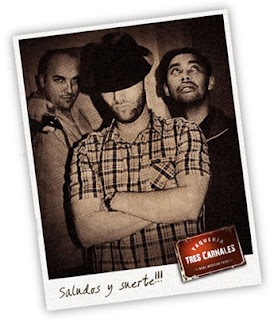 The brains behind the operation are out there with the customers – laughing, conversing, interacting, and enlivening Tres Carnales’ atmosphere with inimitable brilliance. They are indeed the triumvirate of awesome.